Endoscopic papillary balloon dilation (EPBD), which is relatively easy to perform under the wire-guided method, can be an alternative to endoscopic sphincterotomy (EST) for the treatment of common bile duct stones (CBDS), since its first introduction by Staritz in 1982. However, when dealing with patients with large or difficult stones, mechanical lithotripsy seems more frequently used after EPBD, and additional sphincterotomy or repeated sessions of endoscopic retrograde cholangiopancreatography (ERCP) may also be needed. 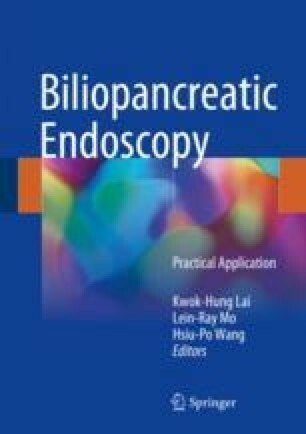 Recent studies have shown that EST followed by large balloon dilation (ESLBD) or large balloon dilation only (EPLBD) for the removal of difficult stones from the common bile duct (CBD) has good efficacy and comparable complication rates as EST. Theoretically, EPLBD without EST is easier to manipulate than the combinatorial method and is also more suitable for patients with concomitant large stones, surgically altered anatomy, and bleeding tendency. In this chapter, we are going to talk about the practical aspect of ESLBD/EPLBD in detail.